Home 2008 WSOP Update: Flack Attacks and Wins Sixth Bracelet; Is It Finally Time for Binger’s First? 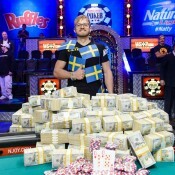 2008 WSOP Update: Flack Attacks and Wins Sixth Bracelet; Is It Finally Time for Binger’s First? Before recapping the 47 tournaments going on concurrently right now, here’s some suggested weekend browsing. 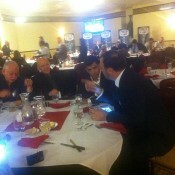 Visit our favorite cougar for her interview with PokerRoad.com’s Joe Sebok (here). Hilarious true story on Astroglide from Kid Dynamite (here). Great pics of 2008 WSOP winners at LasVegasVegas.com (here). Interesting read on the latest UIGEA news at Pokerati (here). 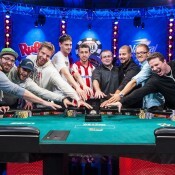 And head over to PokerListings.com for their daily WSOP video recap. :: Event #34 ($1,500 Pot Limit Omaha w/ Rebuys) – It’s been five years since Layne Flack (at right, earlier at this year’s WSOP) captured his fifth WSOP bracelet. Both Flack and Ted Forrest entered final table play with a shot to enter poker elite status by becoming only one of ten people to capture their sixth. While Forrest flourished early but faltered to fifth, Flack went on the attack to finish first. Flack appeared super focused, went hyper-aggressive after Forrest was eliminated, and defeated Daniel Makowsky heads-up for the title. Along with his sixth bracelet, Flack banked $577,725, more than making up for the 20+ rebuys he made in the event. Get full final table payouts here. :: Event #35 (#1,500 Seven Card Stud) – Trust us, you really don’t care. Results here. :: Event #36 ($1,500 No Limit Hold’em) – The mega-field of 2,447 made it down to a final table early this morning. Making his first final table at the 2008 WSOP as chip leader after two previous cashes is Jesper Hougaard with 1,582,000. Danny Wong is third overall with 1,105,000. And the 2005 WSOP final table-ist who made the donk move that knocked Greg Raymer out, Aaron Kanter, is short-stacked with 165,000. NWP‘s Bryan Micon had a strong showing, finishing 15th. Get full final table stacks here. :: Event #37 ($10,000 Omaha Hi/Lo) – Of the 235 who started only 18 remain, and they’ll play it down to a winner today. Ram Vaswani starts the day as big stack with 569,000. Last year Phil Hellmuth told us that Mike Matusow is the best Omaha Hi/Lo player in the world, and he’s living up to that rep stacked second overall with 396,000. Other notable unmarketable big names remaining include Chau Giang (384,000), David Benyamine (378,000), David Chiu (372,000), and Berry Johnston (338,000). Get full chip counts here. :: Event #38 ($2,000 Pot Limit Hold’em) – Not many people mention Michael Binger as a "Best Without a Bracelet" guy, but his run since making the 2006 WSOP final table is just sick. He cashed eight times at the WSOP in 2007. He already has three cashes and a final table this year. And he’s currently the big stack in Event #38 with 146,100. He’s followed by Ayaz Mahmood with 97,600. Get the full final 63 who will play down to the final table today (and a $244,583 first prize) here.